As a Los Angeles soundproofing specialist, I get many calls from individuals and companies to help them with noise control. Some clients have a music studio in their house, while others simply have very loud neighbors. 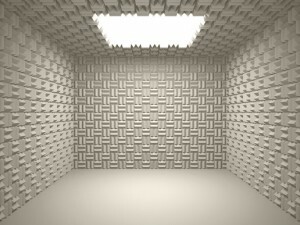 Businesses need soundproofing in Los Angeles so they can keep out the noise from individual workstations and offices. Depending on what type of Los Angeles soundproofing project you require, the job can be extensive or minimal. Sometimes I need to tear down walls and floors to install sound barriers, but other times I can make recommendations that can be done quickly and effortlessly. If you want to completely soundproof your home or office, it is impossible to do so after construction. A thorough remodel will be required. However, there are five cheap soundproofing tricks that work for reducing noise. 1. Padding – Padding is crucial to trapping sound. If you are trying to trap noise in a certain room or office, the first thing you need to do is to remove as much furniture, art, and clutter from that room. You need as many flat surfaces as possible so that sound doesn’t bounce off of them. Here are easy Los Angeles soundproofing solutions for different purposes. A. Floors – If you have carpet on the floors, you’re off to a good start. If you have hardwood floors, purchase a large and plush rug to cover as much of the area as possible. B. Walls – You can purchase acoustical foam for your Los Angeles soundproofing project, which is a special material used for noise control. You can tape it or glue it to the walls. If you are on a strict budget, staple carpet or heavy-duty, double-sided moving pads to the wall. C. Windows – Most sound will come in through windows and doors. Put rods over windows and doors, and hang heavy drapes. Usually drapes that promise to block out sunlight are heavy and have a double layer, and they will be the best at trapping sound. 2. Sound Machine – Depending on what your purpose for soundproofing in Los Angeles, a simple sound machine will do the trick. Do you live on a noisy street and want to block out traffic noise at night? Do you have a small baby and want to keep house noises from disturbing the baby? You probably don’t need to do anything else other than purchase a sound machine. Either white noise or ocean waves are usually sufficient to block out minimal outside noise. 3. Air Leaks – Sound travels through the smallest and the most overlooked spaces. I have had clients spend thousands of dollars on tearing down walls and ceilings to insulate from noise, but they forget that it’s most typical for sound to get in through the tiniest cracks around window frames and doors. Purchasing weather strip sealant and applying it on the gaps will trap any sound traveling through those spaces. Soundproofing in Los Angeles is usually a large project that requires the direction of a qualified and experienced contractor, like Hugs Construction. Hugs Construction has over 20 years of experience and is a full service construction company in the San Fernando Valley and surrounding Los Angeles area. We work on projects of all sizes, such as installing solar panels, kitchen and bath remodeling, wiring and electric work, soundproofing, installing windows and doors, specialty projects and new constructions. To get a quote for your Los Angeles soundproofing project, contact us.